Coconut Allergy is a very rare condition that manifests as an abnormal immune reaction/response to certain products containing coconut fruit, in individuals who consume or use them. An allergic reaction occurs in an individual with Coconut Allergy, because the immune system recognizes certain proteins in coconut as being dangerous and harmful to the body. 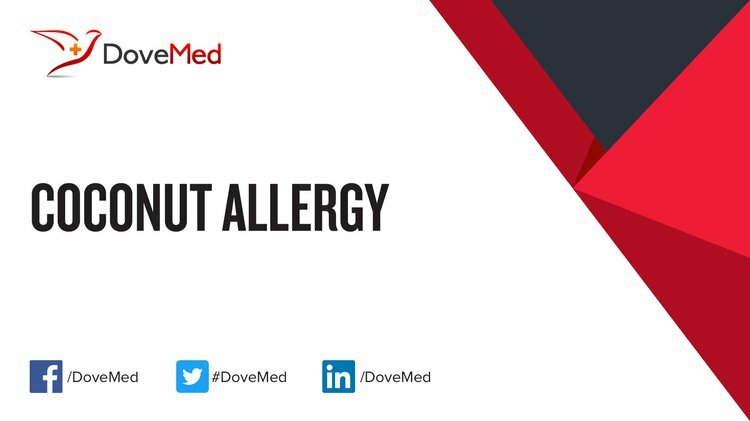 In some cases, a severe allergic reaction termed as anaphylaxis may occur, which is a medical emergency that requires immediate medical attention. What are the Signs and Symptoms of Coconut Allergy? The signs and symptoms of Coconut Allergy may start to appear within a few minutes, to a couple of hours, after the individual has been exposed to coconut-based products. The symptoms are also common to other types of food allergies. In many, the symptoms are mild, while in a few they are severe. Generally, not all episodes of allergy will be of the same severity. In some individuals, the most severe symptom caused is anaphylaxis. However, this is extremely rare in Coconut Allergy. How is Coconut Allergy Diagnosed? Note: Do-it-yourself allergy testing kits that are commercially available are usually not recommended by healthcare providers. What are the possible Complications of Coconut Allergy? How is Coconut Allergy Treated? Provide psychological support to children with such food allergies. How can Coconut Allergy be Prevented? Presently, in many countries, due to labeling and consumer protection laws, foods have suitable labels that indicate their content. Manso, L., Pastor, C., Pérez‐Gordo, M., Cases, B., Sastre, J., & Cuesta‐Herranz, J. (2010). Cross‐reactivity between coconut and lentil related to a 7S globulin and an 11S globulin. Allergy, 65(11), 1487-1488. Stutius, L. M., Sheehan, W. J., Rangsithienchai, P., Bharmanee, A., Scott, J. E., Young, M. C., ... & Phipatanakul, W. (2010). Characterizing the relationship between sesame, coconut, and nut allergy in children. Pediatric Allergy and Immunology, 21(8), 1114-1118. Soyer, O. U., Ozen, C., Tiras, U., & Dallar, Y. (2010). Anaphylaxis in a neonate caused by ceftazidime. Allergy, 65(11), 1486-1487. Aalto‐Korte, K., Pesonen, M., Kuuliala, O., & Suuronen, K. (2014). Occupational allergic contact dermatitis caused by coconut fatty acids diethanolamide. Contact dermatitis, 70(3), 169-174. Surojanametakul, V., Doi, H., Shibata, H., Mizumura, T., Takahashi, T., Varanyanond, W., ... & Tamura, H. (2011). Reliable enzyme-linked immunosorbent assay for the determination of coconut milk proteins in processed foods. Journal of agricultural and food chemistry, 59(6), 2131-2136. Demoly, P., Urbinelli, R., Allaert, F. A., & Bousquet, P. J. (2010). Should we modify the allergic rhinitis and its impact on asthma dichotomic classification of severity?. Allergy, 65(11), 1488-1490. Suuronen, K., Aalto-Korte, K., & Pesonen, M. (2010). Occupational contact allergy to coconut fatty acid derivatives. Contact Dermatitis, 63, 17. Chung, Y. J., Ronsmans, S., Crevel, R. W. R., Houben, G. F., Rona, R. J., Ward, R., & Baka, A. (2012). Application of scientific criteria to food allergens of public health importance. Regulatory Toxicology and Pharmacology, 64(2), 315-323. Bar-El Dadon, S., Pascual, C. Y., & Reifen, R. (2014). Food allergy and cross-reactivity-chickpea as a test case. Food chemistry, 165, 483-488. Zhang, Y., & Jin, T. (2017). Crystal structure of cocosin, a potential food allergen from coconut (Cocos nucifera). Journal of Allergy and Clinical Immunology, 139(2), AB261.